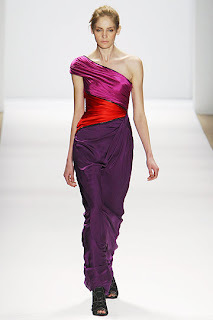 Carlos Miele Fall 2010 is exuberant with colorful, flattering dresses, gowns and skirts that accentuate the body, showing off flattering curves with every step. The palette includes bright prints in red, turquoise, purple, pink, black and white, with solid colors focused on black and a gorgeous cobalt blue. This collection includes strapless, one shoulder or asymmetrical gowns and dresses as well as elbow sleeve blouses and chic fur coats and vests.